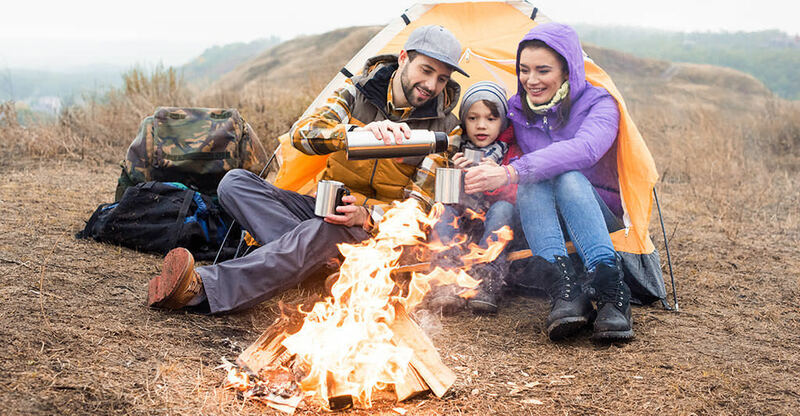 Camping with the family has so much potential for fun, and that’s probably what you were thinking when you planned this trip. But now that it’s time to get things in action, all you can think about is the potential for disaster. It’s there, for sure, but it’s not inevitable. With some advanced planning and forethought, you should be able to sidestep virtually any impending snafus and have an epic vacation with your nearest and dearest. When you’re planning the destination, you may be tempted to go big. But you don’t need a trek to Yellowstone or Big Sur to have an amazing time. In fact, if this is your first-time camping, you’re much better off choosing a smaller and more local spot. Just make sure there’s a body of water and plenty of rocks for the kids to climb. Camping is all about finding fun in nature anyway. Your perfect camping spot may be just a few miles down the road or a short road trip away. There are some spots where you need to make reservations up to a year in advance. This is especially true if you’re planning on renting a cabin. Many people make the mistake of thinking it’s outside, so they’ll never run out of space, but that’s just not true. Even campgrounds have maximum capacities. There’s something you should know about camping with the kids: There’s a chance it may not go so well. Especially if this is your first-time camping, have a plan B. Of course, the goal is to have all the outdoorsy fun you planned, but if things really start going downhill, you’ll want an escape route. This could include going back home or hitting up a local hotel. Everyone swears they’re going to stick it out, but after one mostly-sleepless night, most parents are ready to cave. Always prepare for the worst and hope for the best. You may be planning to live off the grid for a week or so, but remember that you need to get to your campsite first. And you may even have to drive over rough terrain to get to your campsite. That’s why you should always service your ride and check your tire pressure before any camping trip. Instead of worrying about who to bring on your family trip, worry about how you’re going to get there. Make sure your vehicle is in good working order. If you’re planning a service appointment, try to make it about a month before your trip (if possible) so you’ll have time to take care of any maintenance issues your mechanic may recommend. You’re not going to have a whole lot of meal flexibility while camping. It’s not like you can open the fridge and whip something up on a whim. So this means you’ll need to be uber-prepared. Plan each meal (including how you’ll cook or heat it) in advance. This will likely mean prepping food ahead of time, so you can heat it up on the fire when you’re hungry. Oh, and whatever you do, don’t forget the s’mores! Bring a stove and fuel if you’re planning to go that route. If you’re planning to cook on a campfire, find out if there are any restrictions on the campsite. Can you buy wood or can you gather and chop wood there? The last, and most important, thing to plan is drinking water. Do you plan to boil the natural water, bring a portable filtration system or bring gallon jugs. The last is clearly the least desirable for carrying to the campsite. Whatever you do, make sure you have more than enough clean drinking water to get you all through the trip. None of us like to admit it, but the water is even more important than the s’mores. The tricky part about packing for a camping trip is that you have to think about lugging your bags over hills, rocks, and streams (potentially). The bottom line here is that you’ll want to pack light. Pack just enough for each day you’ll there – no extras. If you bring extra clothes for one person, you’ll need extra for everyone, and that adds up. The only exception is when you’re traveling with an infant. Babies are more likely to need a change of clothes, and their clothes are small enough that it won’t make a big difference. Plan to dress in layers, so bring a cardigan for everyone (just one for each person). Don’t forget sunglasses, bandanas, rain gear and hiking boots for everyone too. Before you add to the list, think about whether you can do without the item. Or, if you can drive straight to your campsite, go nuts and bring all the comforts of home. As you’re figuring out what to bring, jot each item down on a checklist. When it’s time to pack up your vehicle, you’ll use this list to help ensure you’ve got everything. Be careful about adding items at the last minute. This is the part that weighs most people down. Resist the urge unless it’s something crucial. The more stuff you have, the more stuff you have to worry about. Camping is as much about uncluttering the mind as it is reconnecting with nature, and you can’t do that when you’re bogged down with material things. This is a time to pretend you’re living off the land, if only for the weekend. It’s important to prepare for any trip, but camping trips require some extra attention. It’s probably not going to be easy to get to a store. And even if it is, the trip will detract from the outdoorsy experience. Plan accordingly and your next camping trip will be a successful one. I may well use this list in the future. My husband is big on organization and has all our things boxed and labeled in either the shed or the loft and likes to plan in advance for trips. I am so disorganized and leave everything until the last minute before ramming things into the car and hoping for the best. Unfortunately, my husband rarely comes on the camping trips with us as he works weekends, so the organization is down to me. This blog might help me get things together a bit better.